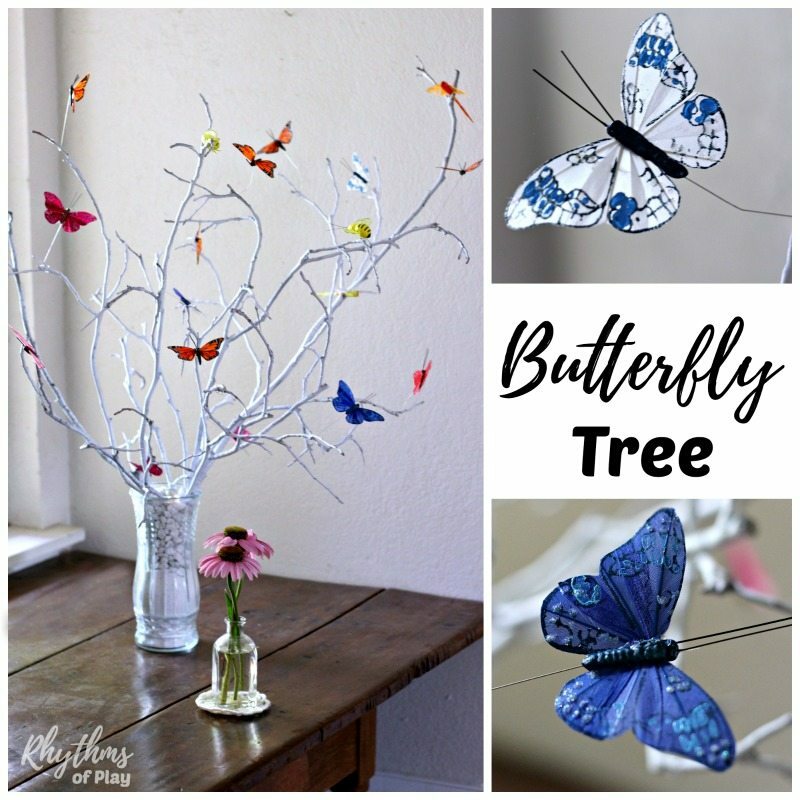 Learn how to make a Butterfly Tree Centerpiece to add a touch of whimsy to your DIY home decor. A DIY butterfly tree makes a gorgeous party decoration or centerpiece for dining tables, entry tables, nature tables, and weddings. Decorate a DIY butterfly tree today! My daughter loves decorating trees so much we have a tree for every season. We decorate a thankful tree in the Fall, an Easter tree in the spring, a Christmas tree in the winter, and this butterfly tree in the summertime for our summer nature table. 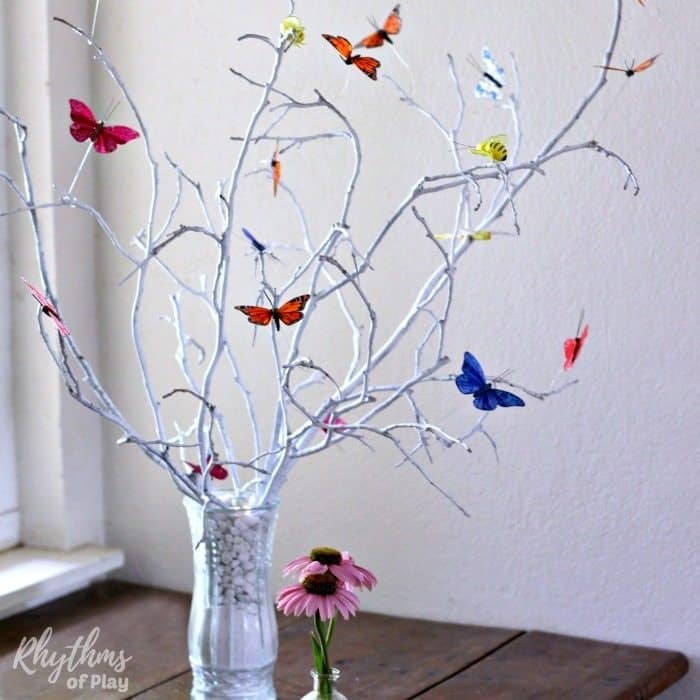 Making a butterfly tree is an easy and fun way to add spring or summer DIY decor to your home. Children love decorating them as much as Christmas trees! When I ran a daycare out of my home several years ago, our butterfly tree was always a hit with the little ones. Make sure you put it far out of reach or those kids will take all of your butterflies! Butterfly trees also make a gorgeous party decoration or DIY wedding centerpiece idea! Just imagine butterflies everywhere! Go on a nature hunt to collect some small bare branches for your DIY butterfly tree. Kids love this activity! If going on a nature hunt for bare branches is not your thing, you can purchase bare branches , white branches or a small twig tree instead. Leave branches natural or use spray paint to paint them white. Allow time to dry if you choose this option. Place branches in a vase . Add sand , pebbles , or vase filler to fill in the spaces around the branches and weight them down so the vase does not tip over. Enjoy decorating your butterfly tree with butterflies, bees, dragonflies , and even birds if you like! A butterfly tree adds a spring or summer element to your home decor. 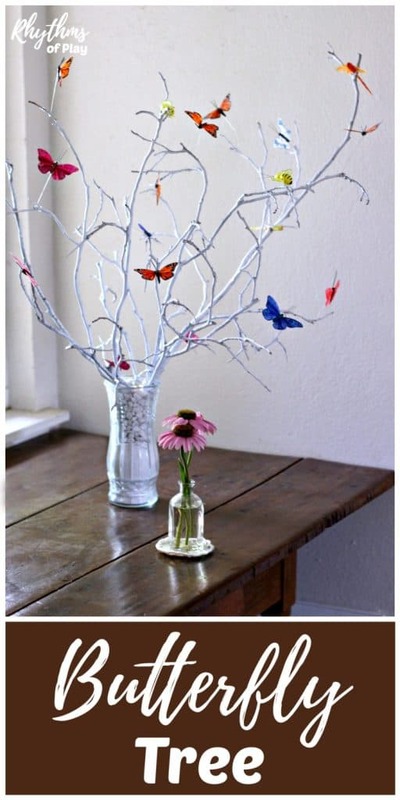 A DIY Butterfly tree is a lovely DIY centerpiece for any dining table, entry table, summer nature table. 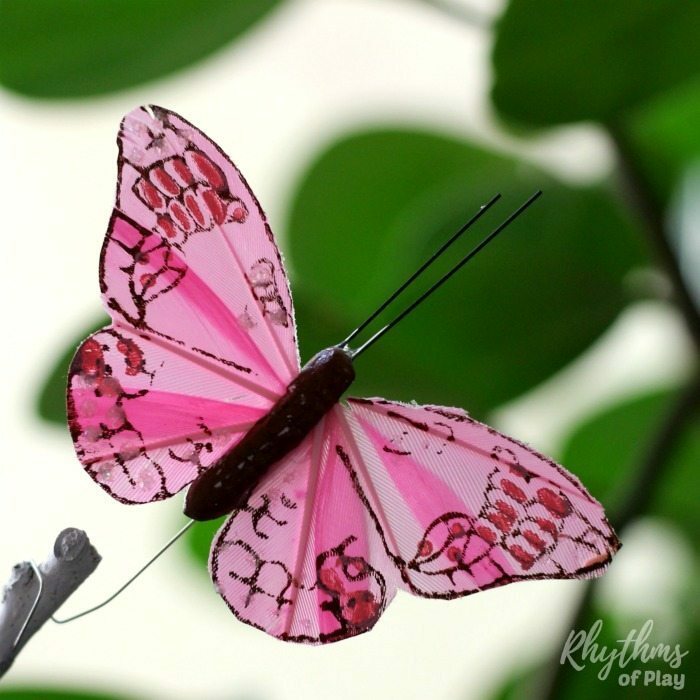 Butterfly trees also make a simple DIY party decoration and DIY wedding centerpiece. OMG this looks so nice! Just a wonderful idea and looks simple enough to do it by yourself. Thank you for sharing this. So glad you like it, Mandy! It is super simple to make, a lot of fun, and looks gorgeous when finished. Enjoy!